Some of our snaps from the Lunar Drive-In 6th Annual Show & Shine grace the thick, glossy pages of the September edition of Cruzin Magazine! The Classic and Rod Club of Vic hosted it’s 6th Annual Show & Shine at the Lunar Drive-In, earlier this year. Situated in the Victorian suburb of Dandenong, this massive four screen drive-in is actually the largest in Australia! This year boasted the largest turn-up ever, complimented by the warm, sunny weather that saw many hot rods, customs and classics emerge from their garages! We attended the evening with great pleasure, snapping away at all the excitement (as photographers tend to do) and now we are proud to announce that our photographs accompany a wonderful article by the talent of Paul Biagini which is featured on page 60 & 61 in issue 143 of Cruzin Magazine! Even though the studio is currently being renovated, here is a sneaky peak from one of our recent shoots with the gorgeous Miss Amy! Although it was pretty good timing that we had concrete floors for this shoot because half the backdrop was naturally there, we are glad to announce that the studio now has a black and white checkered floor. Just to brag, its looking real spunky with the awesome seamless backdrop that has been custom-designed and built in by a very talented tradie. We are now on the home straight with a bit of fitting out to do and some more painting. It won’t be long until we re-open. I’m just itching to set up my lights again and start shooting! I thought I would share with you some exciting news about the new studio, which we are currently renovating to transform this old film production studio on the Mornington Peninsula into an amazing custom photography studio! Here is a little snap of what it used to look like, which I also shared with you all a while back . So here is, if you like, the before shot… vola! Now I could share a “during” photo with you, however that picture would speak a thousand words that I could quite frankly summarise into two. “Under construction”. Things do have to look worse before they look better, so I thought I would spare your eyes from the sight of ripped up carpet, a billion boxes of props, bits of wood, paint and the odd feather boa. Everything is coming together rather well, and the end results will be stunning! I have also taken this “constructive” time to have a little fun and create some more props! My favourite would be the giant white clam shell that I am painting at the moment because it is going to look absolutely amazing with my mermaid tail costume. I can’t wait to shoot with it! Introducing the gorgeous model, artist and burlesque performer Miss Tootsie Doll photographed by Mallory Holley Photography in an “Eye Candy” photo shoot. What a fun shoot this was, with all things delicious and beautiful including the 1928 Ford Model A Roadster, big swirly lollipops, fairyfloss, more lollipops, sugar and of course Miss Tootsie Doll herself! Miss Tootsie Doll will be performing at ritesofpassagefestival this year, AND this talented girl is also the headlining performance alongside the actor Robert England (Freddy Kruger) on May the 4th at the Luwow! If you know any horror movie fans you should definitely invite them along! (see poster below). Pre-sales are avaiiable from Miss Tootsie Doll and The Bad Ladies Boutique, Collingwood. Licorice and Cream & Cherry Trash Designs. My oh my are those handmade garments beautiful! Licorice and Cream is a Melbourne based accessory and pin up lingerie label, specialising in quirky accessories, headwear and knickers for vintage gals! The knickers and camis we photographed not only look (and my model assured me they also feel) mighty comfortable but they look amazing! From cupcake patterns, snakeskin, leopard print and candy cane stripes, what is not to love? I really recomend you check out their range on their website www.LicoriceandCream.com.au or from a number of stockists across Australia! Cherry Trash Designs are based in Brisbane and are simply to die for! They sell super cool t-shirts, necklaces, rings, bows, headpieces and to match the taste-buds of anyone who is bright, quirky, retro, glittery or zombie. If you don’t fit any of those categories, I’m sure you will still find something you absolutely fall in love with. I wanted everything I photographed! Check out Cherry Trash Designs on facebook and follow them! Sadly their old page was hacked so their new one is in much need of some facebook love! Mallory Holley Photography will be attending & covering the Rites of Passage 2012 Tattoo Convention & Arts Festival, which will be held in the Royal Exhibition Building, Carlton Gardens, Melbourne! The Festival is on the 27th -29th April 2012! The festival ‘celebrates creativity as a means to connect’ through the art of tattoo, music, visual arts and environmental awareness in a ‘dynamic, shared space’. Rites of Passage 2012 is one festival you don’t want to miss! The exciting three days will be jam-packed with live tattooing, street and indigenous performances, fashion shows, awards ceremonies, art galleries and retail traders. One hundred percent of the profits made from this wonderful festival will go toward buying old growth forest and agricultural land which will be replanted with native rainforest. We sure are going to look forward to covering and photographing this thrilling event! Hope to see you there! Last week, we had Tegan come to our studio, dragging a massive stay-away bag in one hand, and shopping bags full of Frootloops and milk in the other. Anyone would have thought that she was moving in for at least a month, judging the size of the bag she was dragging. However, her bag was full of this gorgeous, gutsy gurl’s motocross gear, but she wasn’t going to be riding her bike! Instead, I had an amazing time with Tegan, photographing her posing with her motocross gear and motocross branded outfits. You are probably wondering why Tegan had a few boxes of Frootloops with her? Well, surely such a quantity of the delicious cereal it wasn’t for a snack! That many Frootloops would fill a mighty big bowl or even a bath! Ah ha! That’s just what we did! Lucky we had a spare bath laying around! In honour of the 100th anniversary of the 1912 Cadillac, La Cad Magazine has featured our photograph on it’s cover again. This time, our work graces the Autumn 2012 edition. There is also an editorial article about our work inside this wonderful publication on page 15, not to mention a whole heap of other exciting stories, news and articles. Check it out! Mallory Holley Photography will be moving to a new studio! Our new studio has a lovely bathroom & kitchen and lots of room to shoot, as well as heaps of storage space for our massive range of props and clothing, with plenty of room to add more! Here’s a sneaky, sneaky peak of what it looks like now, although once we move to our new studio it will be undergoing a full makeover and total customisation. We will keep you posted with the exciting news! On Saturday 25th of Feburary, 2012, It wasn’t just the temperature which was hot in Dromana, thats for sure! The Dromana Drive In welcomed in approximately 500 really hot cars. The list included; special interest vehicles, Variety Bash Cars, Hot Rods, Rat Rods, Classic Cars, Muscle Cars and many more! With all proceeds of tickets and items from the auction supporting the worthy cause of Variety; the children’s charity. We were kindly invited to participate in all the fun as one of the many wonderful trade stands. We brought down our original FJ Holden packed with some of our recent work and albums and created a mini-exhibition. We had a great night meeting so many new smiling faces and wonderful people. Great live music was enjoyed by all, and a carnival enjoyed by the children, both big and small. There were families with picnics and barbecues burning, deck chairs and nibblies, whilst others decided to hit the dance floor and kick up their heels to the rock and roll. Others went for a walk, checked out the trade stands and admired the hot cars that had rolled up to enjoy the night. It was amazing that so many car enthusiasts could get together for a fun night whilst supporting such a worthy cause, with many opening their hearts and wallets in the name of charity. What a wonderful effort you all did, raising around $23,000! The night would not have been so successful if it had not been for the organisers who kindly volunteered their time to put in a mammoth amount of effort to create such a successful & fun night. Such an amazing night was, of course topped of with some brilliant fireworks, and of course a movie! Last Saturday night, is surely a night to remember! Support Variety -The Children’s Charity! Shannons Saturday Night at the Drive In is TOMORROW NIGHT!!! (Saturday 25th Feb). Yes! tomorrow night is the night that the Dromana 3 Drive-In on the Mornington Peninsula will come alive with 500 classic cars, street customs, muscle cars, hot rods, rat rods and other special interest vehicles for a special screening and entertainment. It sure is going to be a big night! With the gates opening at 3pm & films at dusk, the raffles will start at 8pm and fireworks at 9pm! We are going to have a mini exhibition there, so make sure you check out our stall and say hi 🙂 You can also check out the other auto trade stands, children’s playground, 2 red hot bands and the 1950s diner. There will also be some special guest appearances! Make sure you dress up too! There is a competition for the BEST retro/nostalgic fancy dress! If you are coming along, we look forward to seeing you there! If not, BOOK ONLINE NOW for your tickets & come along to have a great night & Support Variety -the Children’s Charity. The 3rd of February 2012 was the perfect afternoon and evening for the Lunar Drive-in 6th Annual Show & Shine! Kudos to the Classic & Rod Club of Vic for putting on a great night! It was the biggest turn-up ever! Of course, complemented by some amazing weather that saw many stunning hot rods, muscle cars and classics emerge from their garages and join in all the fun! Below are some of our snaps from the night for you to enjoy! If you are interested in purchasing any of the photographs from the night, please contact us. Keep your eyes out for Cruzin Magazine! Amongst the pages of great articles and cool cars will be our photos from a grouse night at the 6th Annual Show & Shine at the Lunar Drive In, Dandenong, Victoria! 70s Holden “Woody Van” station wagon on air-bag suspension -a great car for beach themed shoots! Won’t your photos look amazing with you posing with one of these cars? You could also pose with a stunning 70s Harley Davidson bike with lots of chrome plus a brand new one too! And of course, if you would like a pin-up, couple or family photography with your own pride and joy, no problem! Check out our packages or contact us and book your shoot today! Guess what?! Tomorrow is the very first Tuesday of February!!! That means that the car park at the peninsula lifestyle centre is going to be jam-packed with hot rods, street machines, American muscle, rat rods, classic cars, Aussie muscle, anything with a chrome bumper and Corvettes too! It’s a tough choice of which ‘baby’ to pick, but will be taking our lovely original green 1955 FJ along tomorrow and joining in all the fun! Come over and say hello! You can have a flick through our photo albums that we will have on display and catch up with all the latest goss! Last night we had the pleasure of photographing Tony’s stunning 1966 Cadillac Coupe Convertible, at a scenic beach on the Mornington Peninsula under the golden rays of the setting sun. Check out our cars page for more photographs from Tony’s cadillac shoot! Happy new year everyone! What a great year 2011 has been! Finally we can show off our vintage vixens from last year! So much excitement, inspiration and positive experiences lies ahead for 2012! Heaps of quirky and unique shoots have already been booked for burlesque and pin-up styles, as well as car, wedding and event shoots. An amazing year looks like it lies ahead, so welcome to the new year! Rad retro stall @ Santa Cruz! Heaps of specials! Mallory Holley Photography will be hosting an rad retro stall at the Lets Go Cruisin’ Santa Cruz on Tuesday 6th December 2011. Come along for some wicked specials on photo shoots! Also see some sleek hot rods, street customs, American and Aussie Muscle cars and much more! Have the chance to WIN some amazing prizes! Mallory Holley Photography will be donating some photo shoot vouchers the charity raffle! Mark the date on your calendars and highlight it in fluro pink! It is an event not to be missed! Join Let’s Go Cruisin’ for some Christmas Cruisin’ at Santa Cruz at the Peninsula Lifestyle Centre, cnr Bungower Rd & Nepean Hwy Mornington on the 1st Tuesday in December from 5:00pm – 9:00pm. Family entertainment in the car park. We suggest you being a rug or chairs for the kids, big and small, to sit on in front of the stage. Chairs to the rear please. Santa Claus will arrive at 7:00pm. Parents wishing to have Santa give a present to their children [12 y.o. and under] should wrap an item [value no more than $5 please] with your child’s name and age clearly marked and drop it off to our members at the LGC tent. Santa handed out so many presents last year, he asked for some helpers this year. After he arrives, we’ll be asking children to arrange themselves into age groups to receive their present. We’d appreciate parent’s helping Santa to do this. The raffle prize for this night is a Cruisin’ themed Christmas Tree complete with presents. It will definitely be worth taking home. We also have a number of overflowing hampers and other goodies for runner up prizes. All proceeds from this raffle will donated to a local charity. Tickets can be purchased at the LGC tent for $5 each. All entrants will receive one free ticket at the gate. LGC Cruisers will receive one ‘free’ bonus ticket. We will have Santa Cruz stubby holders available at the Let’s Go Cruisin’ tent. They are $8 each. There will be a BBQ outside the Sober Mule Café as well as meals and take away food inside. If it’s wet, Santa will still visit and the cruise night will still be in full swing, so come along anyway! All this for $5/car for Santa Cruz entrants, including LGC Cruisers. Off street parking for non pre ’75 entrants will be available within the Lifestyle Centre complex as well as in Bunnings adjacent. Look for the signs & marshals. 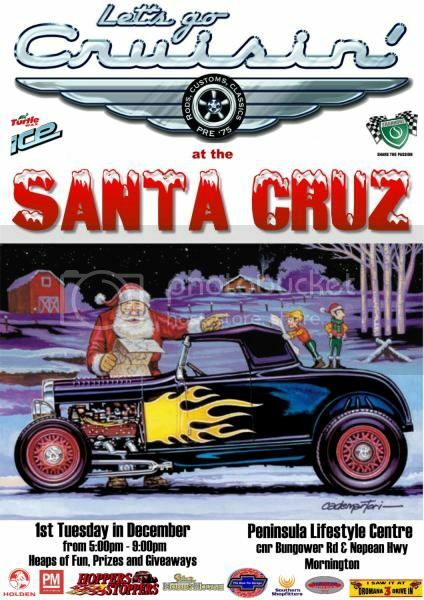 So come along to the Santa Cruz and you’ll be able to check out Santa’s hot rod sleigh as well as lots of cool cars, take home a great Xmas Tree or lots of other prizes all the while being entertained. Recently I was given the task to photograph some stunningly detailed quilts and creations by Lee Vause. The detail of these works are just brilliant! I also took a portrait of her to put on her Threads and Tangles website. You can check out my photographs of her amazing works of art on my promote your business page! I really do recommend that you check out her Threads and Tangles website too! Just a note to say hi! Hello and welcome to my blog. My name is Mallory Holley and I am a lover of all things vintage and retro. I am also obsessed with classic and muscle cars, especially Cadillacs and Corvettes. Additionally, I love to embrace every day of my life with creativity. I enjoy writing, drawing, sewing, painting and fiddling with cars. However, most of the time I’m taking photos of pretty much anything and everything. If I’m not doing that, I’m usually editing them. I am a photographer, after all and I truly enjoy what I do. I do hope that you enjoy my blog and the future posts that I write for you. Feel free to comment on any of my posts to let me know what you think. Don’t be shy! If you require any further information about my photography, or are interested in booking a shoot please do not hesitate to contact me.